**Many thanks to NetGalley, Berkley Publishing Group, and the author for the opportunity to read and review a free ARC of this book. We know very little – next to nothing – about why there are serial killers. I can’t give you a solid reason why I am morbidly obsessed with serial killers. I know that it originated mostly from a strong desire to understand what makes them do what they do, and then also to learn how I can best avoid them. I’ve read countless novels featuring serial killers who vary between brilliantly organized and rage-filled disorganized types, those with calculated MOs and those with no apparent method or motive at all. 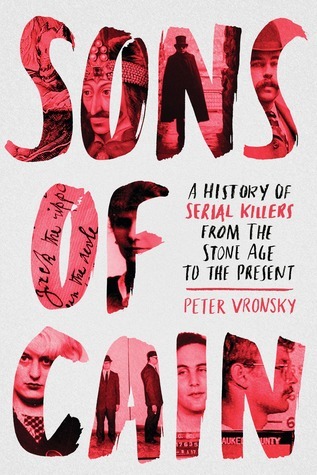 Sons of Cain is also not the first nonfiction book I’ve read on the subject of serial killers, but it is one of the most methodically researched in terms of overall focus and breadth of discussion. Vronsky begins at the very beginning of human existence and follows the life cycle of man into present day and on into our possible future encounters with compulsive multiple murderers. A chilling journey. Mother Nature is a cruel psychopath herself, with no empathy for her progeny. Vronsky explores the natural survival instincts of Neanderthal man and his rival Homo Sapiens and their contributions to the killer instincts of those who have confessed to multiple murders. The eras of supposed werewolf/vampire slayings and witch huntings are also featured. Occurrences of serial murders in historic times is perhaps the most interesting and gruesome part of this book. Oh, and of course, Vronksky’s personal account of the day he literally ran into a very vicious serial killer himself – and lived to tell the tale. Well-researched and meticulously footnoted and annotated, the book seems to be very inclusive; however, it knowingly neglects female offenders in this category. I guess we have to refer to his previous book, Female Serial Killers: How and Why Women Become Monsters, for that. Also, he mentions that our typical description of a serial killer is a 30-year-old white male; however over 50% of serial killers are now African-American. However, very few are featured here. The book does do a good job though of exposing little-known male offenders that aren’t often included in serial killer discussions headlined by the likes of Ted Bundy, Jeffrey Dahmer, and Jack the Ripper. Sons of Cain was at times captivating (especially Vronsky’s personal encounters – yes, there was more than one) and at times gruesome and disheartening. There are graphic descriptions of individual crimes (sensitive readers be warned) and discouraging statistics about the vast numbers of killers in the world today, the even higher number of victims, and the infinitely varied reasons why serial offenders become what they are. Psychopaths do not “feel” and are disoriented when asked to describe emotions which are foreign to them. Psychopaths can feign the outward appearance of emotions, but they don’t know how to describe them effectively in words. I mentioned before that my obsession stems from a desire to known the unknown and to answer the unanswerable question: why? I can’t say that this book answers my question, but it did give me a greater understanding of the social and environmental elements that “create” the psychopathy in people that later become killers. Please don’t read that as me sympathizing with them in any way. I don’t. But research has shown commonalities in upbringing and traumas experienced by these people – and that those experiences can contribute to altered mental states, I believe. Ultimately, there are no easy answers, and Vronsky states as much. This was not an easy book to read, but it was definitely gripping and scary in a way that none of my fiction favorites could ever aspire to be. 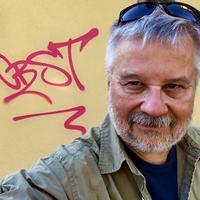 PETER VRONSKY is an author, filmmaker, artist, and historian. He is the author of a series of books on the history serial homicide: Serial Killers: The Method and Madness of Monsters and Female Serial Killers: How and Why Women Become Monsters. The third book in this series, Sons of Cain: A History of Serial Killers From the Stone Age to the Present is scheduled to be released in August 2018 by Penguin Random House – Berkley Books. He lives in Toronto and Venice, Italy.